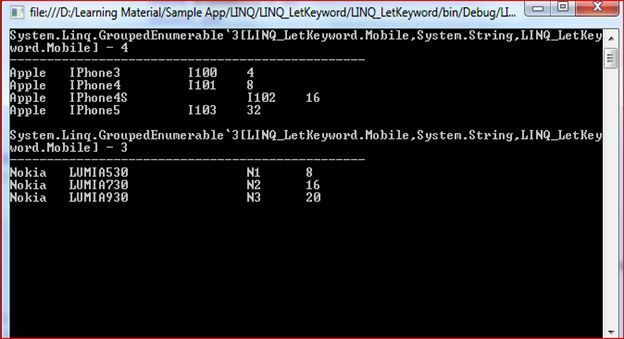 This article shows two keywords of LINQ. These keywords are very helpful when working with a set of object collections using LINQ. First I will go through the Into keyword and its use. I used the following collection in this article, on which I've done actions in this article. The Into keyword allows creating a temporary variable to store the results of a group, join or select clause into a new variable. 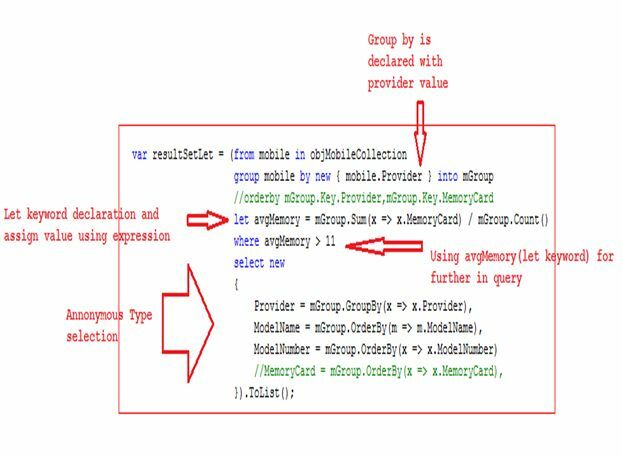 In the above query after applying Into on mobile groping it creates the type mGroup variable to apply the next filter or create a temporary variable “mGroup” for further operations. The Let keyword permits you to store the result of the query that can be used further in subsequent queries. It creates a new variable and initializes it with the result of the expression and can be used further in queries just the opposite of the Into keyword, which means you created a new variable and you also can use the previous variable so you can use both in the further operations. This is the complete code used in this article. I wish it will help you utilize both features at the best.